Earlier this week, we learned that Lamborghini was considering a less extreme, ‘more politically correct and elegant’ design direction to appeal to ‘a different kind of customer’. In the same breath, though, design director Filippo Perini reassured the world that Sant’Agata would continue to build ‘really extreme’ supercars. And if anyone knows how to do really extreme supercars, it’s Lamborghini. Here are 10 of the wildest cars ever to wear the Lambo bull – some of them perhaps a bit too wild for their own good. Old man Lamborghini was never keen on racing (or supercars, in fact – he was more of a GT man) so the Miura never hit the track in anger. Lambo’s chassis engineer and test driver extraordinaire Bob Wallace had his own ideas though, building the Jota in his spare time as a ‘What If’ project. With special aircraft-spec alloy bodywork peppered with lift-cutting spoilers, experimental suspension and a reputed 440bhp squeezed from its V12, it was a bit of an animal. Although replicas have been built since, the original was destroyed in a fiery accident, thus sealing its wildchild status forever. Wild is the certainly the word here. Pretty, not so much. Built on Aventador running gear to celebrate Lambo’s 50th anniversary, the Veneno featured 740bhp, vents big enough to swallow a Smart car whole, and was somehow road-legal. 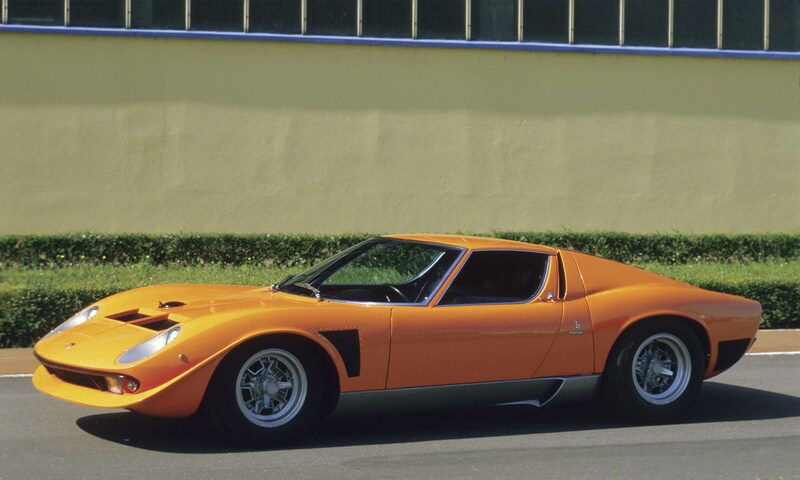 For those that missed out on the three hardtop versions, Lamborghini also created a handful of roadster variants (pictured above). The price? A cool £2.8m. Making the Veneno look like the height of restraint and good taste, the Egoista was a one-seat-only, Gallardo-engined mash-up of Apache helicopter and single-seater racing car. Like the Veneno it was created as part of Lambo’s extended 50th birthday festivities but never made the jump from concept to production. Thank God. A concept to explore just how far Lamborghini could push its carbonfibre structure know-how (Sesto Elemento means sixth element, or carbon in other words). It packed the Gallardo’s 5.2-litre V10 and four-wheel drive yet still managed to weigh in at 999kg. Actually amazing. A Lamborghini SUV isn’t a new idea. If and when the next one arrives, it probably won’t be anything like this one, though: a Countach-sourced V12, 345/60 R17 Pirelli tyres, and two metres of overall width. Originally designed as a military vehicle, the ‘Rambo Lambo’ ultimately became a toy for playboys. In one of those perfect car-matches-owner incidences, Mike Tyson had a heavyweight and slightly scary LM002 tucked away in his garage for a time. The Diablo was always more than a little bit intimidating, but the GT derivative (born out of the track-only GTR, pictured) was downright threatening. Wider-than-wide front arches, a weight-saving composite bodywork diet, yet more power from its 6.0-litre V12 and rear-wheel drive. Top speed? 210mph. Yikes. Retirement presents don’t come much better than this. To say cheerio to celebrated test driver and engineer Valentino Balboni, Lambo binned the Gallardo’s front driveshafts to make a rear-wheel drive, manual gearbox-only, racing striped wonder named in his honour. With a name that’s essentially Modenese for ‘cor blimey’, the Countach had to have a place in this list. It looked like nothing before when it first landed, but an awful lot of cars have looked like it since. It became gradually wilder over the course of its long life with various skirts and spoilers but arguably the most mental of the lot was the experimental carbon-bodied Countach Evoluzione, a project overseen by a certain Lamborghini engineer called Horacio Pagani. Back in 2007, the stealth fighter-inspired, Murcielago-based Reventon was the priciest Lambo ever, weighing in at around £840,000. Of course, that’s peanuts now compared with the Veneno. It doesn’t look quite so wild these days either, especially since the Aventador nicked most of its styling cues. Still, it was inspired by jet fighters, and its version of Lambo’s evergreen 6.0-litre V12 produced a brutal 641bhp – enough for a 214mph max speed.